Enquiries & Wants Board . Here is a place to post requests for information on individual craft, search for class associations or perhaps start one of your own. Let us know where plans are available, tell us about a vessel which has been in the family for years - you know the sort of thing. Model makers looking for sources are welcome here too but should also try our model making pages. Browse through the pages there is much of interest. 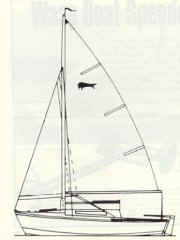 These charming small sailing cruisers were designed by M S Redman during the late sixties and early seventies. We would very much like to hear from anyone who built a Barbel, has one, or has plans for one - particularly the 14ft version. Photographs would be a great bonus! Perhaps there is a Barbel hiding at the end of your garden or by the fence at the club?